HEARTS and Hibs are both pursuing the signature of Raith Rovers left-back Sean Mackie. The 17-year-old has been offered a contract by both Edinburgh clubs and is now weighing up his future. He impressed during a training stint at Riccarton last week and was offered a deal for a minimum of three years. 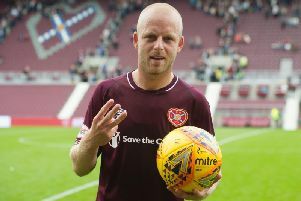 He spent the last two days in talks with Hibs officials, including head coach Alan Stubbs, and has been offered a four-year contract to sign on at Easter Road. Mackie was due to train with Hibs for the rest of this week but instead asked for time to consider his decision. Any transfer would take place at the end of the season and the teenager is keen to take the opportunity to move. His Raith Rovers contract expires in June 2017, meaning the Kirkcaldy club will be due a fee from whichever club wins the fight for his signature. Both Hearts and Hibs see Mackie as a development player who could graduate to first-team level in time. He made his only senior appearance so far for Raith at the age of 16 last August, when he played as a late substitute against Alloa in the Championship. He joined up at Stark’s Park two months previously on his first professional contract, becoming the first youngster to graduate to Raith from the Fife Elite Football Academy. He is regarded as an athletic full-back with good defensive qualities and a cultured left foot, who has the potential to play at the highest level. Hearts and Hibs are both in the market for a younger left-back to bring through from their academies. The Tynecastle club signed Nigerian internationalist Juwon Oshaniwa last summer but he hasn’t commanded a regular starting place in the first team as yet. Lewis Stevenson is the established left-back across the city at Hibs, however, Mackie is viewed as a possible successor in that role.